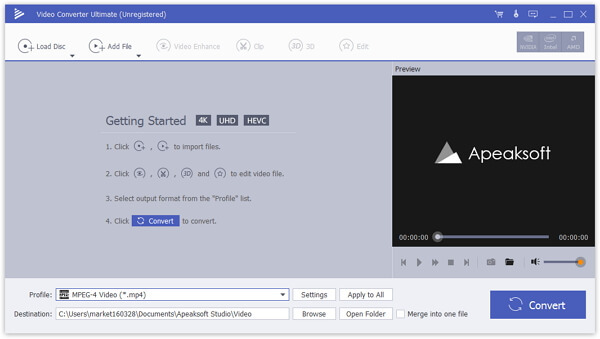 Apeaksoft Video Converter Ultimate 1.0.16 無料ダウンロード - Convert video to all popular video formats and download video. Apeaksoft Video Converter Ultimate helps convert any video to other formats like MP4, MOV, AVI and more so that you can enjoy your videos on more devices. Before your conversion, you could edit video effects. And the new added enhancement enables you to enhance video by optimizing brightness and contrast, upsacling video resolution, removing video noise etc. This excellent software enables you to convert any video and audio to various formats such as MP4, AVI, WMV, HD MPEG-4 MP4, 4K MP4, MP3, AVC and more. So that you can use the converted files on multiple devices. Convert video or audio files to iOS devices, Android devices, USB flash drives or external hard drivers easily.